Be the first to share your favorite memory, photo or story of Nina. This memorial page is dedicated for family, friends and future generations to celebrate the life of their loved one. 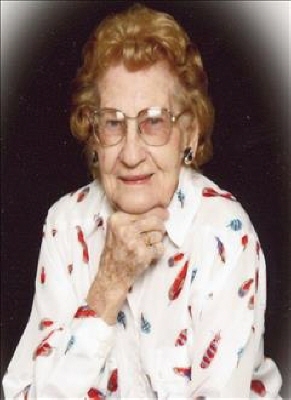 Nina B. Maddux, 98 year old Woodward resident, died Monday, April 1, 2019 at the Alliance Health Woodward. Funeral services will be held 2:30 p.m. Saturday, April 6, 2019 in the Billings Funeral Home Chapel with Gene Karn officiating. Nina Belle (Fussell) Maddux was born November 26, 1920 north of Curtis, Oklahoma to Sam and Mary (Majors) Fussell. Nina attended grade school at Enterprise School and graduated from Mooreland High School in 1939. She was united in marriage to Harold Maddux on August 7, 1940 in Cherokee, Oklahoma and they farmed between Mooreland and Freedom for a few years. To this union two sons were born, Larry and Donald. When Harold was drafted into the United States Army in 1944, she moved into Mooreland. Harold worked in the oilfield so the family lived in several states and towns, moving back to Mooreland in 1960. Nina worked as a Seamstress at Tregos Factory for 11 years. They moved to Woodward in 1976. Nina and Harold spent winters in Yuma, Arizona for 15 years, which she enjoyed very much, but she has enjoyed being in Woodward with family and friends the past several years. She is survived by her two sons, Larry Maddux and wife Margaret of Detroit, Michigan, Don Maddux and wife Sherry of Mooreland; grandchildren, Duane Maddux and wife Vickie of Mooreland, Michael Maddux and wife Belenda of Tulsa, Carolyn Nielsen Romano and husband Kirt, Sarah Bijlani and husband Scott of Detroit, Michigan, Kate Woolard and husband C.J. of Chicago, Illinois; numerous great-grandchildren and great-great-grandchildren; other relatives and friends. Nina was preceded in death by her parents, husband Harold in 1999, three sisters, Carrie, Frances, and Mary and six brothers, Jack, Bill, Lewis, George, Clarence, and Fred. To send flowers or a remembrance gift to the family of Nina Maddux, please visit our Tribute Store. "Email Address" would like to share the life celebration of Nina Maddux. Click on the "link" to go to share a favorite memory or leave a condolence message for the family.